I used to have a serious problem in what to do with old uniforms of my children. Blame that on the indecision I felt as they bear their school's logo. There is something so disrespectful about turning them into rags like we are wont to do with old clothes. But I cannot ignore the need for more space for uniforms that are still being used, year in and year out. So here is what I did. Who can use my children's old uniform? It is a no-brainer to answer that it would be the younger children going to the same school. Fortunately, there are such children in our own neighborhood. After the end of every school year, I separate the uniforms that no longer fit them but are still in good condition. Then I find the children who will have use for it. Just remember to be careful to course this through the parents as some may actually not welcome this offer and feel insulted rather than thankful. It is necessary that the uniform we offer is in good condition and not in a condition which you yourself wouldn't allow your children to use. I usually ask my close friends about possible recipients so I would be assured that my offer is welcome. Old shirts, shorts, and jogging pants usually fall under this category. These are clothes that are comfortable enough to be worn at home but are not in a physical condition fit for school use. These pieces may be faded, stained, have small rip or holes that can still be sewn. 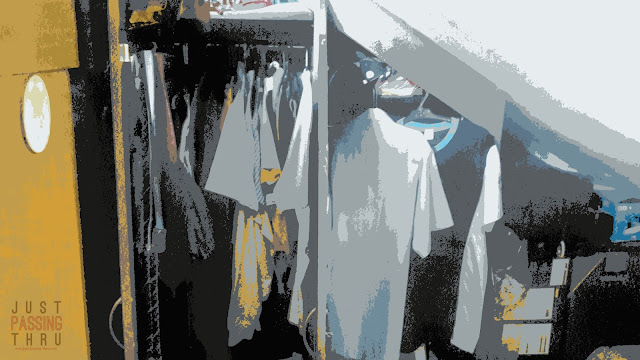 Once designated for home use, I remove them from the space allotted for uniforms and place them with home clothes. They in turn replace old home clothes that need to be retired or given away. This is more challenging to do than the first two options. Recycling old uniforms to produce what can be seen as a new clothing piece is not easy but it can be done. It requires creativity and the willingness to work on it. Parts of the uniform that makes it one, like patches and embroidered or printed logo can be removed or covered. In other countries, there are shops that accept clothes for recycling and then given to charity. Isn't that a wonderful way to use clothes that have served our children well? Uniforms should not be disposed of carelessly especially for company uniforms that may present security threat when placed in the wrong hands. School uniforms are not as sensitive, although the possibility of it being used other than what it is intended for cannot be totally discounted. That said,. it would be well to find ways to dispose of things that we don't need, to be of use to others once we determine we are just hoarding them unnecessarily. We are doing ourselves a service when we leave space in our lives to move rather than waiting for the time to dispose of things when it is no longer useful to others as well.